Check out the following article from Robot Stock News on a new small and potentially disposable robot for use by the military. This continues the development of military robots that will be partners with soldiers on the battlefield. An excerpt from the article follows below and there is a link to the full article at the bottom of the page. iRobot Corp. has developed a new microbot for military applications — the paperback-sized iRobot Ember! This hot new bot, still in the prototype stage, is featured on iRobot's new Facebook page for its PackBot family. As you can tell from the photos iRobot posted on the page, Ember resembles a miniaturized PackBot, complete with iRobot's flipper technology allowing it to right itself and climb over obstacles. 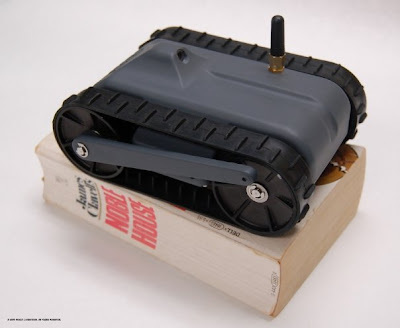 The iRobot Ember was developed under DARPA's LANdroids program, which is intended to create teams of tiny robots for military applications, including, as the name implies, setting up an ad-hoc network of hotspots. The robots are intended to be about 1 pound each, be smart enough to detect and navigate around obstacles and ultimately cheap enough to be considered disposable.